Mary Bayes was a servant and housekeeper here in 1861. By 1867 it seems she had taken over. Built in 1759 at a cost of £2000. Opened as a bath house 19th May 1760. Ballroom added in 1788, this was later converted to a billiards hall. A Mr Allen was proprietor at the end of the eighteenth century, he died in 1796. The house was known as Allens during his era. Offered For Sale by Auction Wednesday 4th September 1816, occupier William Revans having conveyed all of his property to Trustees for the benefit of his Creditors. Given as the BATH HOTEL from 1835. 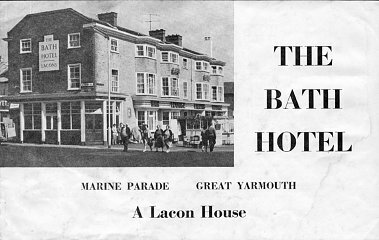 10th April 1841 - Thanking the Nobility and Gentry for their Liberal Support over the previous ten years, Mr. Bly advised that he could offer Accommodation equal to any other Lodging House or Hotel upon the Beach and had Two detached Cottages to Let Furnished. On the evening of 23rd February 1843 Miss Bassingthwaight gave the first Juvenile Ball at the Bath Rooms. The event was very well attended and kept up to great spirit til a late hour the following morning. There was a merry dance to the band of Mr. Cotton and excellent provision was made by the proprietors, Mr. and Mrs. Bly. Miss Bayes was awarded £4 10s, to be paid by Mr. Smeeth (ex landlord of the Royal Hotel) at a hearing held Wednesday 20th March 1860. Miss Bayes had let a furnished house, situated in Kimberley Terrace, to Mr. Smeeth. It was furnished and when he departed left in February some articles were damaged an a ton of coal had been used. Matthew H. Winder announced 30th June 1860 that he had taken the house, as well as continuing to run the NORFOLK. The Bath Hotel had been entirely refurbished. Servants were charged for in bills. 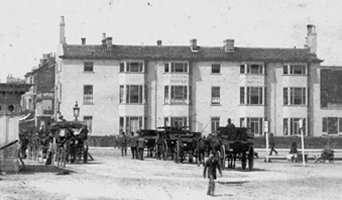 Address as South Beach in 1854. Closed for the duration of WWII according to a letter dated 26.07.1940.